As you know if you follow the Big Sky at all, on Tuesday night Weber State travels to Montana in a game that has big implications. Both teams are 14-1 in the Big Sky, and the winner of this game will be the Big Sky regular season winner. Here are just some of the implications for Tuesday night's game. If you are not familiar with the Big Sky, the winner of the regular season also hosts the semifinals and championship game in their building, which helps to give them a huge advantage of advancing through the conference tournament and into the NCAA Tournament. Montana is 13-2 at home this year, while Weber State is 15-0 in Ogden. Whoever wins Tuesday night will have a big advantage heading into next week. As mentioned on Monday morning, Portland State has won five straight conference games, and they have the talent (with Charles Odum and Chehales Tapscott) to give teams fits. I can guarantee that neither Weber State nor Montana wants to be facing a confident PSU team on a neutral court next Tuesday night. Every bracket I have seen has the Big Sky winner as a 15 seed in the tournament, but maybe one of them could sneak up into the 14 line, which would be a big help for trying to pull off an upset. Weber State is in the mid 70s for RPI, while Montana is currently at 102. Whichever team wins will be getting a nice resume builder to brag about. Montana has won 11 straight games and 17 of their last 18. Weber State has won 7 straight games and 17 of their last 18. As they say, something has to give. The winner will head to the conference tournament riding a wave of momentum, particularly if it's Weber State, since that means they will have beaten the Grizzlies twice this year. WHO WINS: This is a game that I have gone back and forth on many times, because obviously either team is capable of winning the game. I saw both teams in person within the last few weeks, and both were extremely impressive. However, if I had to make a choice, I think Weber State is going to go in and get a huge road win. For one, Weber has the best player in the conference in Damian Lillard. I have written about him almost ad nauseum on this site, but in case you missed it, here are the vital statistics. He is explosive, has the best first step in the conference, and can get a shot off almost anytime. 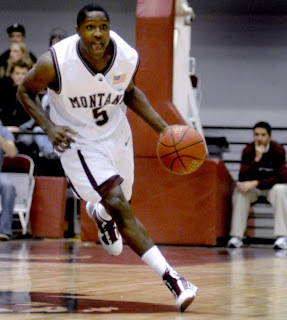 Will Cherry is the second best player in the Big Sky, but he is not in Lillard's league yet. Another thing is that Montana gets a lot of their offense on forced turnovers, and they really create turnovers well. Weber State is one of the better teams in the country at avoiding turnovers, which all starts with Lillard. In these two teams first meeting (an 80-64 win in Ogden), WSU remarkably had only four turnovers. As an ISU fan, no team has impressed as much as Montana this year. Montana is just so big and physical and their big men can shoot (Selvig is tough to deal with). Then again, I saw Weber State in person in Pocatello and we know what happened there, probably not their best game. I do think that either Montana or Weber State could steal a NCAA first round game, particularly, if they could get a 14 seed. Nice summary, thank you. I read some quotes from ISU coach Deane Martin. He was talking about denying Lillard the ball and really trying to keep it out of his hands. They held him to 15 points, but at some point Lillard will get his. I like Montana tonight. The home court and the defensive versatility of Art Steward, Kareem Jamar, and Will Cherry will throw off Bamforth and Lillard. If Frank Otis plays tonight, that could have an impact on the game. Montana 64 Weber State 57.